10 Body Sense Q. "Why is it important to disclose my health information to my practitioner before my massage or bodywork session begins?" A. It's important to disclose all conditions and medications on your health history intake form because certain techniques, or all bodywork, may be contraindicated— not recommended—for your condition. This information also allows your therapist to choose modalities that may be more beneficial than others for your specific situation. Be sure to update your therapist every session about changes in your health and medications since your last visit. This helps ensure you'll receive a safe and therapeutic bodywork session that's tailored to your unique needs. 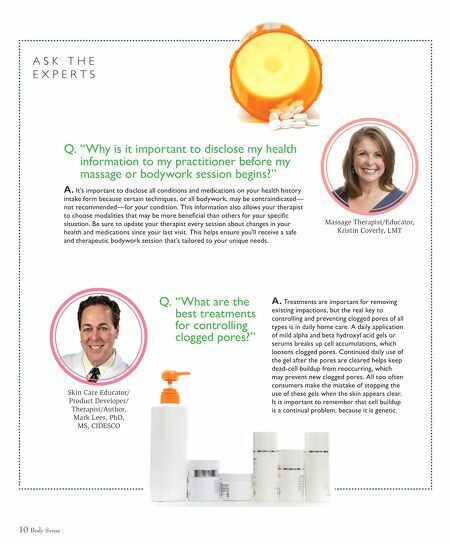 Massage Therapist/Educator, Kristin Coverly, LMT Skin Care Educator/ Product Developer/ Therapist/Author, Mark Lees, PhD, MS, CIDESCO Q. 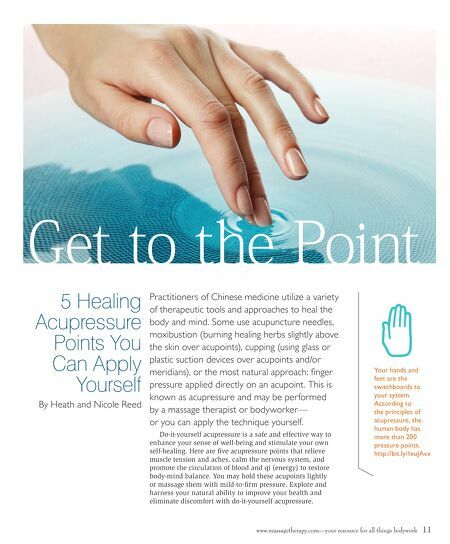 "What are the best treatments for controlling clogged pores?" A S K T H E E X P E R T S A. Treatments are important for removing existing impactions, but the real key to controlling and preventing clogged pores of all types is in daily home care. A daily application of mild alpha and beta hydroxyl acid gels or serums breaks up cell accumulations, which loosens clogged pores. Continued daily use of the gel after the pores are cleared helps keep dead-cell buildup from reoccurring, which may prevent new clogged pores. All too often consumers make the mistake of stopping the use of these gels when the skin appears clear. It is important to remember that cell buildup is a continual problem, because it is genetic.